Hi Sewing friends! I sewed something for my baby the other day...he is more like a toddler now and not so much like a baby. 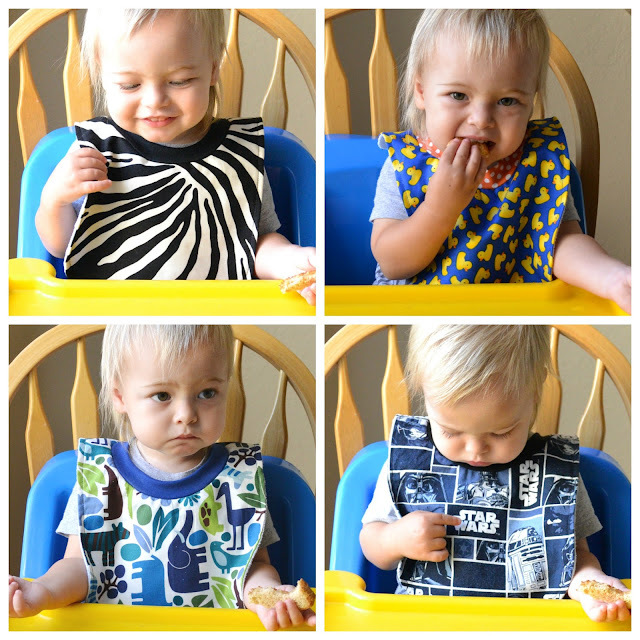 He had grown out of all his little bibs so it was high time I made him some new ones. Plus, I have a baby!! I should be sewing cute things for him!! (that's what I say to myself at least) I use my Pullover Baby Bib tutorial and changed it up a little to make them. Have a look. Instead of using terry cloth I used a layer of minky fabric for the backing and a layer of printed cotton instead of an applique on the front. I love how bright and colorful they are. He loves that they have pictures he can recognize on them. The animal one is his favorite. I keep them stuffed in the space between the chair and his booster seat so they are ready when he needs one. I also used knit fabric for the neckband instead of ribbing. It didn't have quite as much stretch as the ribbing so I had to increase the length of the strip to 14'' instead of 11''. I'm hoping to write up a new tutorial soon. He loves them all and reminds me to put one on him if I forget. To tell you the truth though, he didn't like them one bit at first. He kept trying to pull it off. Thank goodness he likes them now because they sure are cute, and so is he. Love it! So, so cute.